CHAPEL HILL: Wes McKinney, 65, passed away on Monday, January 28, 2019 at Duke University Hospital in Durham. He was born in Roxboro, NC to the late John Wesley McKinney, Sr. and LaRue Burns McKinney. Mr. McKinney was a graduate of Western Carolina where he studied to be a Medical Technologist. He loved deep sea and surf fishing with his best friend Rob. 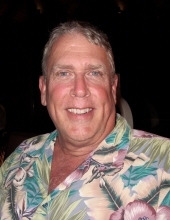 He had a passion for traveling, scuba diving and spending time with his kids and grandson. Mr. McKinney was an avid Duke Blue Devils fan. Mr. McKinney is survived by his wife, Dr. Michele Karl-McKinney; daughter, Virginia “Jenna” Nicole McKinney; son, Ryan Edward McKinney (fiancé, Jessica Rice); grandson, Wesley William McKinney; sisters, Connie Cox, Kathy Harris; nephew, Michael Cox; and brother-in-law, Russell Hartwell. The family will receive friends from 1 to 3 p.m. on Saturday, February 2nd at Clements Funeral Home in Durham. In lieu of flowers, the family request that memorial donations be sent to Compassion International at https://www.compassion.com/. To send flowers or a remembrance gift to the family of Wes McKinney, please visit our Tribute Store. "Email Address" would like to share the life celebration of Wes McKinney. Click on the "link" to go to share a favorite memory or leave a condolence message for the family.